Rob Carr and Curt Stager with the Communicating Climate Science students. Photo by Rob Carr. Gatekeepers are people who, with current research-based information, can influence the public to make more informed choices based on the changes that are happening locally as a result of climate change. The concept of “gatekeepers” was first developed by Demos, a think tank in Helsinki, Finland. The Wild Center connected with Demos through The Wild Center’s partnership with Hereka, a museum in Finland, which works with Demos to develop outreach programs. Recognizing the potential in applying this to a college course, Carr and Stager developed their SENCER-ISE project around the concept. 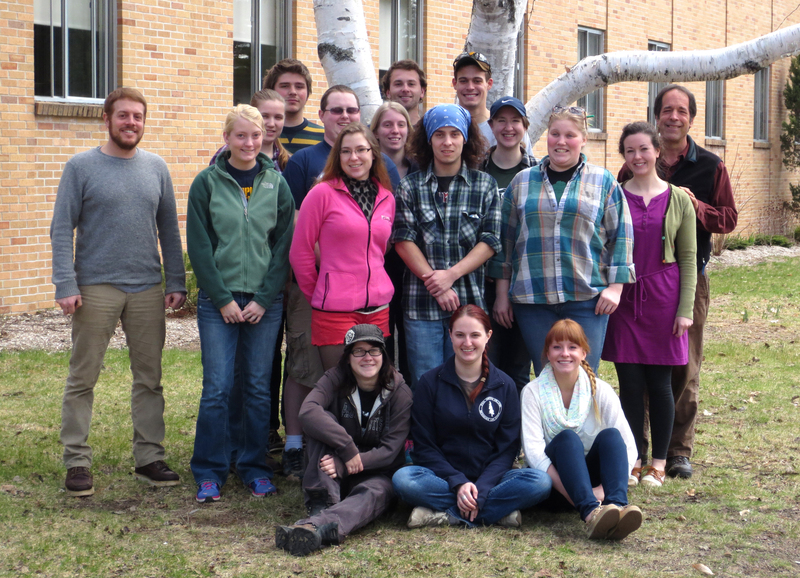 The course allowed students to explore concepts of climate science particularly related to the Adirondacks, and study interpretive educational methodologies to effectively communicate their research. The students also had the opportunity to Skype with Demos to learn more about the concept of the gatekeeper program, including its benefits and drawbacks, and tactics that have worked well in Finland. During the course, students also prepared presentations for four different gatekeeper audiences that focused on how climate change has and will impact each group, and what they can do to spread the word to the public. Gatekeeper audiences included a fish and game club in Saint Falls, NY, that was presented information on how climate change is closely tied to the hunting and fishing seasons; a group of local artists that learned about how regional climate change can be interpreted through paintings; a group of local musicians that explored to discuss climate change through songs, album art, and performances; and a group of Lyme disease researchers from the Trudeau Institute in Saranac Lake, NY which was presented with the impact that climate change has had on ticks that serve as vectors for Lyme disease. The researchers were so impressed with a graph that the students created using Center for Disease Control data showing that cases of Lyme disease have increased over the last 10 years, that the researchers have used the graph in a multi-million dollar National Institute of Health grant application. The local musicians and artists, and researchers were given their climate science presentations at SAM Fest (Science, Arts, and Music Festival), a one-day festival held on the Paul Smith’s campus. The festival and climate change presentations were also open to the public. An example of one of the student presentations on using music in interpret climate change can be found here. In addition to developing and giving presentations, students were responsible for evaluating the effectiveness of their own presentation by creating their own goals and measureable objectives. The student groups also developed their own methods to measure those objectives, whether it was through evaluation, or with follow-up activities with their audience groups. Posted in Partnerships, Paul Smith’s College & The Wild Center.